Are you an IATEFL LTSIG member? Then this CPD opportunity might be for you. 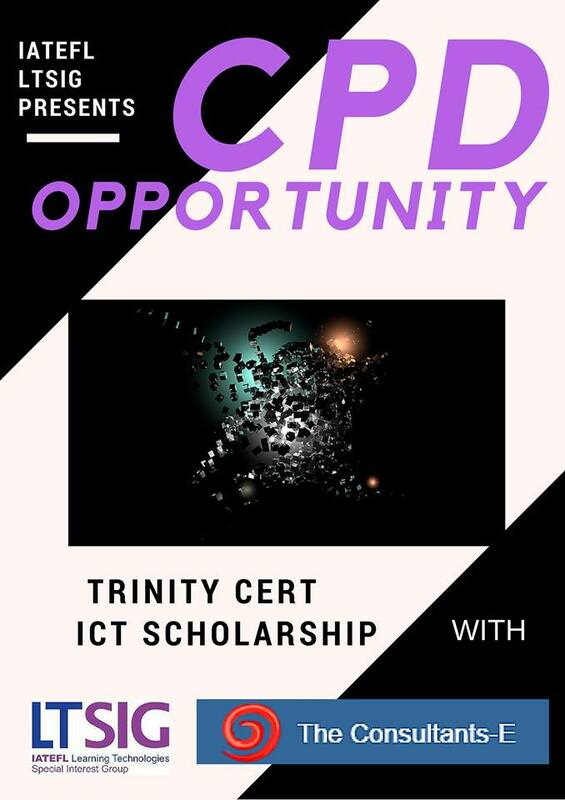 Trinity CertICT scholarship with the ConsultantsE is coming up soon!! The IATEFL LTSIG is collaborating with the ConsultantsE to bring you unprecendented support in making the most of educational technology. The ConsultantsE specialise in EDtech training. They work with schools, universities, and private educational foundations, as well as with Ministries of Education and NGOs (Non-Governmental Organisations). The CertICT – Certificate in Teaching Languages with Technology – is an international qualification validated by Trinity College London. It gives language teachers the skills to use a range of learning technologies, in a principled and effective manner. It is structured in three modules and takes up to 9 months to complete (October-June). Check out this exciting new scholarship at the ConsultantsE website. This opportunity is for fully paid-up LTSIG members, so stay tuned! !